Introduction: Doesn’t it seem strange that though shivering can warm us in the cold, the reflex usually occurs after we’ve already come in to a warm, safe room — when we no longer need it? Posted for d’Verse Poets Open Link Night. Presently I am inspired to explore metre as I read a wonderful book by the fascinating Paul Fussell (1924-2012) called “Poetic Meter and Poetic Form“. Fussel first published this book in 1965 but then, after using it for 12 years to teach his classes at the University, he revised it with new insights — which makes it more valuable. I never thought I’d read a book like this but I love what I am learning about language and poetry. Below I take a stab at scanning my poem to understand its meter. But you can see that I am still confused. How should I label the metre of this poem. Is either of these accurate, or are both possible? Or have I misunderstood the stress in my own poem? Insights (albeit late, like a shiver) from knowledgable readers would be deeply appreciated. Do you ever formerly scan your poems? Hi Sabio, a very nice poem which shows your study of meter. I don’t really do polls–except the Gallup poll of which I am a member (ha)– but when writing formal poetry I do pay pretty close attention to meter. I tend to use a cheater’s method though. What I do is I use a modified syllabic count in which I listen for feet numbers without actually noting them. So, in a sonnet or villanelle, I will try for a pentameter line which will typically fall between 9 and 11 syllables. The range comes because I will not always be using iambs but other feet types — anapests or dactyls or spondees. Sometimes I will separate out the feet but usually if I have the syllables within my range I mainly listen to the line shifting words to make things sound “right”. If I keep within the appropriate syllabic range this works fairly well as I won’t be too far off in my number of feet. In a shorter line i tend to work the same way but stay even more tightly within syllabic range unless Im pretty sure Ive got the foot room. It is not perfect–especially if you only want iambs– but if you combine the syllabic count with listening closely, it works pretty well. Sorry on iPhone on train so may not be coherent. K.
Sabio – off train – I’d meant to add that I count all the syllables (and sometimes feet) out on my fingers before writing anything down, usually saying the line silently and counting. k.
Like how you show how it comes due. Cold can make one quiver a long while after it comes due, when thoughts and feelings finally sink deep. I know what you mean about shivering in a WARM room after coming in from the cold. Brrrrrh. In an attempt at a form poem with meter, I do it in my mind and say something ‘silently’ like da-dah, da-dah, da-dah to see if it works out! Most of the time, however, I write free verse. I do enjoy form occasionally though. on December 4, 2012 at 4:05 pm Miriam E.
most of the time, i let the words flow, but when i’m in the mood for meter, i read the words out loud and see if it fits. I agree about shivering when we come in from the cold. I also agree with Miriam. Tend to ‘read’ it aloud in my mind, sometimes in a whisper to myself, and if I feel it reads okay to me, I’m happy. Keep working that meter; although it won’t “necessarily” be warranted for the Quaterns we’re looking at Thursday – it should be in 8 syllables, or four feet of iambic, or four feet of trochee. The “idea” is that it should all “box” in fours. I’m pleased your working through rhyme and meter in English. It isn’t easy even for those of us who are primary English speaking. I live in Texas and keep a dictionary handy – we move stresses on words around willy-nilly here. Oh, heavens to Betsy! I am not even anywhere near that process in my poetry, Sabio. I like your poem though. I love the truth in this, and the music (meter). In general I write free form, but I am always fascinated to learn more about the process of writing the formal forms. The cold has some sharp teeth and we are bit (or nipped) before we know it. I like your short pieces, very much. Unfortunately, I can’t help much regarding metre. You’ve just opened a whole new world to me that I need to look into. Thanks for that. excellent write up. Love the notes, the notion about the feeling the shivers once inside warmth is something I’ve always thought, cool to see another notice that as well. Really nice verse and think it’s fantastic how you broke it down for us. Great post. 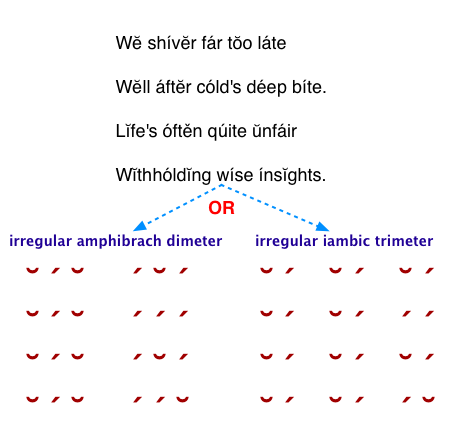 Your verse is iambic trimeter–an iamb is unaccented/accented and trimeter is three feet of them), but I would not worry that rule except to rearrange and cut prose into poetry. Form and meaning working together is best. I love Sonnets, partly because English is naturally Iambic and English sentences, mine anyway, are pretty naturally iambic pentameter, yup, just like Shakespeare. Rhyming them takes extra time and intention. 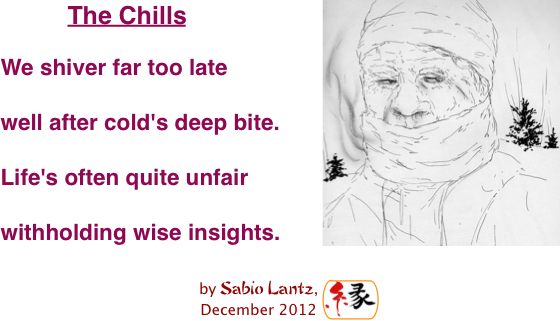 Your meter works here for the cadence of the shivering, the withheld insights. Readers and writers, unlike teachers and students, don’t need to get the names of devices. We need to feel their effects. Here you have me shivering on two levels: (1) knowing I am freezing too late to remedy it, and (2) rocking me into that insight, like a baby in a cradle. The poem is a marvel on every level. Bravo! Keep experimenting to feel the effects of different meters–our poetics challenges are great for that. This was one of life’s little pleasures today. Thank you! A good example of less conveying more. Great economy of language here. Great analysis Sabio! I for one is not into it. I just ‘hear’ silently and hope for the best. I never look at or write poetry this way. Interesting to see. Once learned, the rhythm of words never leaves your ear. Wonderful that you are exploring deeply into the heart of poetry. Wow, thanx for all the comments. Glad several of you liked the poem. (3) I did it a little. I hope to slowly do #4 because I am really interested in language. Interesting that you say “English is naturally iambic…” I will have to investigate that further. Thanx, I will look at Steele. Thanx for scanning. I will compare. I just looked at my diagram again and noticed that I accidentally reversed the labels of the two options. No one said anything. Maybe no one got that far. 🙂 I don’t blame them. I find shivering actually doesn’t help me feel any warmer…in fact I’d wager it makes me feel colder. as for meter, I find it quite aggravating and frustrating. I’m constantly looking up multi-syllable words up and often find myself pronouncing extra syllables in single syllable words like smile and fire….very annoying. still, I enjoy the challenge and the final sound. so keep working at it—I think in the long run it’s worth it. Using meter can be a lot of fun, playing around with how the words drip out the quill. I usually goes with iambic, but then you know it. Often a whole line just falls out with little effort. The rubaiyat I trend to write these days become almost second nature, so I am casting about for something more difficult. Interesting exploration of ideas here, Sabio–enoyed the discussion, and learned some things as well..
Life does make us work for insight, doesn’t it?! Good work here. As far as scansion goes, I concur with Susan above–iambic trimeter, and to me it reads strictly regular, no variations. However, meter is not so definite a thing as we might like (or hope), since ears are different. (This makes for some heated discussion amongst poetry scholars!) And a reader may stress a different syllable based more on meaning than sound or feel. At any rate, I think a poet is always wise to be a student of sound, the way words and meaning dance around each other, the rhythm of words as a special kind of music. To me, the one of the best compliments one can give a poet is, “You have a good ear.” Some come by it naturally, but scansion practice can help develop awareness to the way things sound.